The oldest NL poker tournament in Europe has just broken another record – with the biggest prize pool in the event’s illustrious 26-year history. With 367 entries on Day 1a and at least 700 for Day 1b yesterday, there is now more than €1m up for grabs, more than double the event’s €500k guarantee. Players can still buy in up to 2pm today, with final numbers – and the exact prize pool – to be confirmed later. Among those through from Day 1b yesterday, either from scratch or firing a second (or even third) bullet were WSOP bracelet winner Barny Boatman (58,200) and his brother Ross Boatman (63,400), Will Kassouf (69,600), Jude Ainsworth (47,500) and former Irish Open champions Marty Smyth (67,100), Unibet Ambassador Ian Simpson (69,400), and Dan Wilson, the latter looking for unheard-of back-to-back titles and nursing 61,100. However it’s Anthony Ho, with 239,500, who took the overall top spot in chips for Day 2, with Niamh Breedy finishing 1b with 206,200 in the runner-up spot. With 370 confirmed survivors from Day 1b, and 174 for 1a, that’s at least 544 players for Day 2 so far. Registering right up to the wire will award a 30bb as a starting stack, and with such juicy prize money available here, it’s likely at least a couple of players will be entering – or – re-entering today. Other Day 2 players will include MainEventTravel’s MD Fraser MacIntyre (53,800), WSOP November Niner Griffin Benger (115,700), local hero Kevin Killeen (25,400), who won the High Roller event, UKIPT Dublin winner Max Silver (46,000), Andy Black (58,000), Irish poker legend Padraig Parkinson (19,600), American pro Elena Stover (18,900), former Irish Open champions Ian Simpson (69,400) plus EPT founder and new partypoker LIVE President John Duthie (56,100). 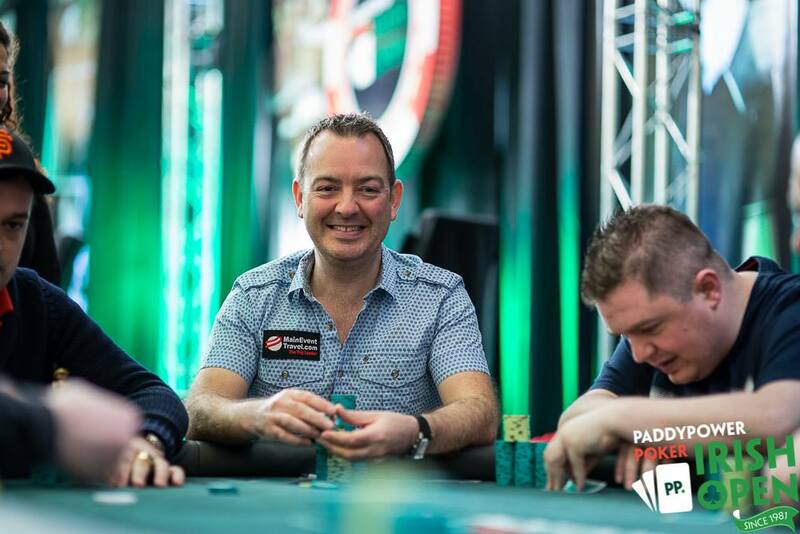 Last year Irish player Dan Wilson took down the Main Event for €150,000 after beating a giant field of 802 players generating a €801,500 prize pool. A €500,000 guarantee, legendary atmosphere – and popular Shuffleboard outside the main tournament area – make this a really unmissable event. The Irish Open is and one of the world’s most prestigious and lively poker festivals.